As the largest city in the U.S. state of North Dakota, Fargo can afford to speculate about a redesign of its downtown core. Considering the state of the U.S. economy, one might question the planning of such an ambitious venture. But, in contrast to the rest of the nation, North Dakota’s economy is experiencing boom-like symptoms, supported mainly by the energy and agricultural sectors. Until recently, most outsiders regarded Fargo as a sleepy, northern, small city. Now, with a metropolitan population of 200,000 and growing, the community can think bigger and better. Choosing a design competition for a downtown plan is an interesting move in this direction, even though this was only an ideas competition, and there is no guarantee any of the ideas from this event will be used. The competition was sponsored by The Kilbourne Group, a progressive local developer specializing in a broad range of urban projects—with concentration on the preservation and reuse of existing structures, as well as new construction. 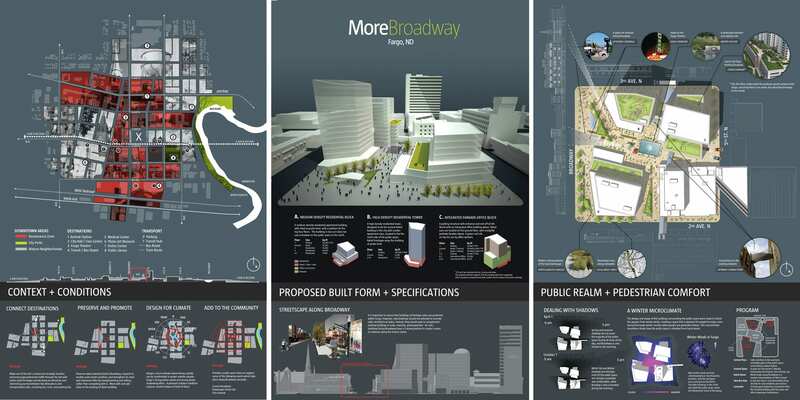 The site of the competition was a city block located in the very center of the downtown, with the focus on creating a multi-use space that could accommodate retail, residential, parking, office and open space for civic use, bringing new energy to the downtown. 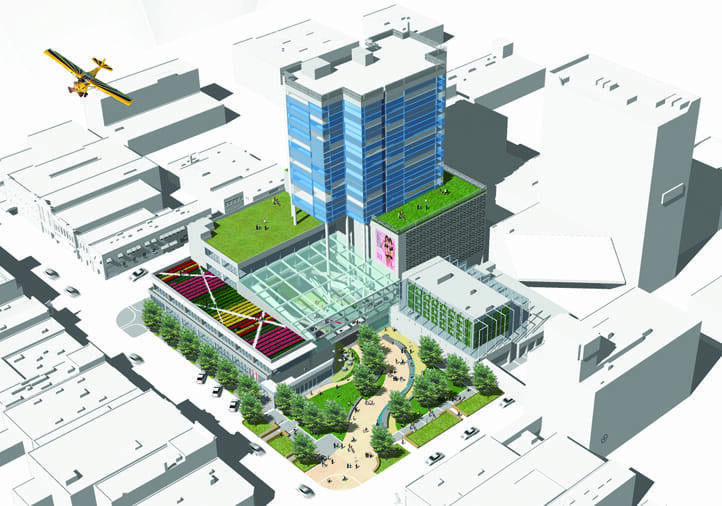 The idea for a competition arose in 2009 when a dated parking garage occupying one-quarter of the U.S. Bank block was demolished. 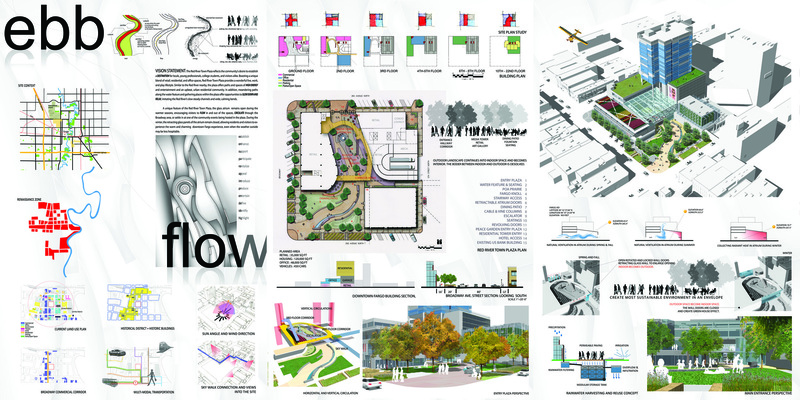 Rather than see this garage simply replaced by a new parking structure, The Kilbourne Group felt that a competition could generate a more progressive solution for the site. Of the total prize money of $29,000, there were two first place awards of $10,000 each. One went to “Fargo 365” by a design team from Philadelphia, Pennsylvania (David Witham, Doug Meehan, Anna Ishii and Hannah Mattheus-Kairy), and the other to “Ebb and Flow,” designed by Nakjune Seong and Sarah Kuen, two college students from South Lake, Texas. 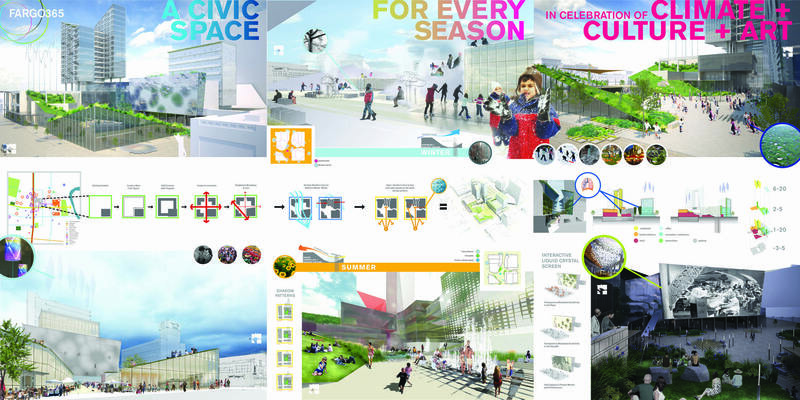 Second place *($5,000) was awarded to the local Helenske Design Group’s “Vertical Plain.” The jury also awarded three honorable mentions of $1,000 each. Of three People’s Choice awards, the most popular received $1,000. Many of the teams chose a similar approach to the site—large atria as an entrance feature bounded by retail and a high-rise. Here one invariably has to think of Berlin’s Sony Center by Helmut Jahn. Although this block is considerably smaller than the Sony site in Berlin, lessons can be learned from Sony that are in part implemented here, the most important being various penetrations into the site’s interior. The main attraction of the “Ebb and Flow” entry was a generous glass atrium. Its retractable entrance could remain open in warmer weather and closed in the winter. An attractive winding path through a plaza to the entrance from the main street was a reference to the nearby Red River. “Fargo 365” emphasized the multi-purpose use of the site throughout the year. Here the plaza’s semi-interior form was created by locating a modest triangular element at the corner, featuring a green roof, gradually sloping down to the interior. Punctuated by two main entrances from the two adjoining streets, the partially hidden plaza received a strong focus, drawing people in by virtue of the functional nature of the site. Moreover, by partially enclosing the plaza, a certain level of intimacy is present, without creating a barrier to the outside pedestrian. With the exception of the high-rise structure, the buildings all were adorned by green roofs, certain added protection—and an energy saver—in view of North Dakota’s severe winters. 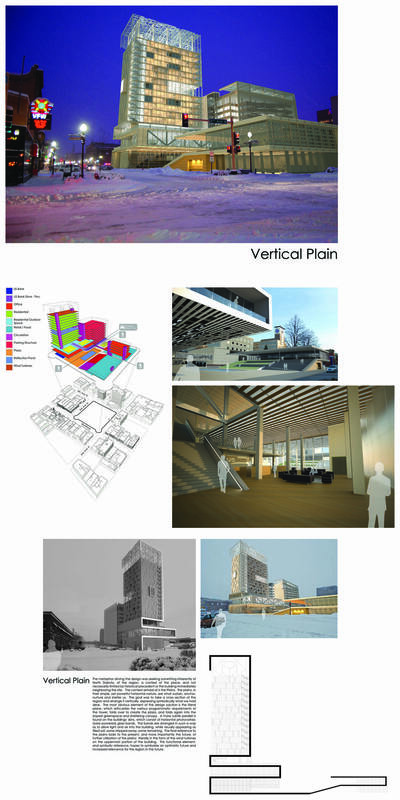 The Second Place entry, “Vertical Plain,” was mainly about the treatment of a high-rise structure which was supposed to symbolize elements of the ‘plain.’ By including solar panels and wind turbines in the mix, this design strived to give the impression of a highly energy-efficient structure. However, without the narrative on the symbolic connection to the North Dakota plain, this would probably be lost on the casual observer. The competition produced a number of interesting ideas, from parking structures to soaring towers challenging the eye. A number of very doable ideas resulted, and one can only wonder if the powers that be might engage one of the winners to provide Fargo with a new downtown look.